This is probable one of the best example’s of a film made more interesting by a discussion that followed its screening. The film in question was Enemy (2013) showing as part of the Robert Burns Centre Film Theatre Film Club Season. Introduced by our host for the evening Julie McMorran, but as she admitted it was more of what was not said rather than what was said because of giving to much away that she feared would spoil the enjoyment, if that’s the right word to use! But she did inform us that the film split both critics and its audience with its ‘non signposted’ narrative. She went on to say that the films screenplay, written by Javier Gullon, was based on the novel The Double by Jose Saramago, which was first published, in Portuguese, in 2002. The French-Canadian Denis Villeneuve directed the movie whose best known films to date have probably been Incendies (2010), where twin brother and sister go on a journey of discovery to unravel the mystery of their mothers life, and Prisoners (2013) a thriller about the search for two girls after they have been abducted. This last film also stared Jake Gyllenhaal who in this latest movie plays both main parts. The film club recently screened one of the actor’s best works in the form of Nightcrawler (2014). His role of Lou Bloom gained him a well-deserved selection of Best Actor nominations. Julie told us that this popular actor already had four more films in the pipeline. 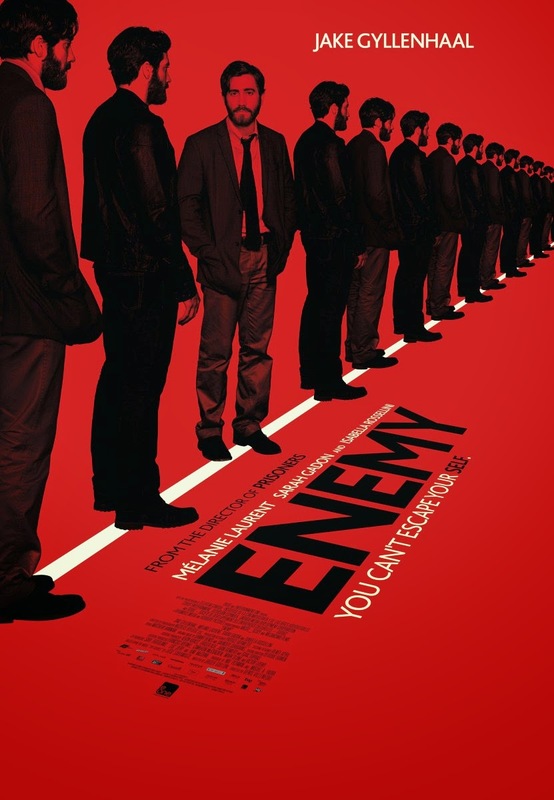 Enemy is an extremely confounding psychological drama about a sexually repressed college professor, Adam Bell (Gyllenhaal), who quite by chance discovers that he has a doppelganger in the form of an actor called Anthony Claire (Gyllenhaal again) who like himself lives in Toronto. Although the two men are physically identical they couldn’t be more different in personality! Other than to say this strange discovery leads both men into some very dark places I will not say any more to avoid any chance of a spoiler. The film also stars Melanie Laurent as Adams girlfriend Mary, Sarah Gadon as Helen, the pregnant wife of Anthony and Isabella Rossellini in a ‘blink and your miss her role’ as mother. When this film was premiered at the 2013 Toronto Film Festival it mysterious ending left its audience in a stunned silence and I for one am not surprised. Its obscure story is rather ponderous and I’m afraid did not draw me in, it has been alleged that its source novel is just as difficult to comprehend. Our discussion that followed the movie led to all sorts of assumptions as to what the film was really about and who exactly Adam and Anthony were. Were they two different people; are they really one person or maybe identical twins separated at birth and is Rossellini the mother of both? Perhaps when you go to see this film, or if you have already have seen it, perhaps you could let me know your theory and I’ll pass it on to the RBCFT Film Club?